Abu have produced reel cages, spools, star wheels, side plates, end caps and even line guides (as well as handles) for Ambassadeurs in various styles and colours. So, if you are the kind of person who likes to use tackle that looks a little different, swapping components around from various models of Ambassadeur can create distinctive looking reels. This might not make any difference to your catch rates, but it's a bit of harmless fun. The hard part is tracking these parts down! There are also replacement parts available from other sources, some of which are listed on the links page. The most common modification made to Ambassadeurs (other than throwing away that annoying thumb rest) is a change of handle. For cranking techniques a Power Handle is recommended. Various colours are available so you should be able to find one to match the reel you want to fit it to. There is also a 'Japanese' version which, while looking smart with its cutaways and having a better spindle construction, is, apparently, prone to bending. 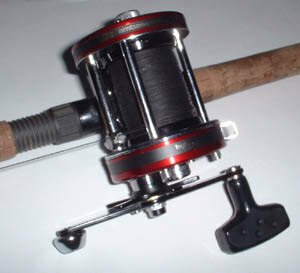 The short counterbalanced handle with the hard, flattish grip, is good for jerkbaiting and twitching techniques as it speeds the reel up a little to take up slack line. Also, the short counterbalanced side of the handle doesn't get tangled up in your clothing like the second grip on a standard dual grip handle can do! If you don't like the rubbery, flat grips that are fitted to most Ambassadeurs these days (the grips have been known to pull off some versions when making a powerful strike!) then an older style handle with the hard, round grips can be fitted. There have been a number of handle nuts and caps used over the years, but the chromed cap-nut (24104), retaining plate (20944) and screw (301) will fit most current Abu handles and look pretty good too - but you might have difficulty locating the cap-nut in the UK. The short counterbalanced handle will need an alternative plate, as the screw hole is closer to the nut. There are handle sources on the links page. Since the introduction of dual bearing levelwinds, there isn't much point considering upgrading a standard levelwind to a single bearing one. if you can't get a dual bearing levelwind locally, try Hatteras Outfitters who usually have them in stock. Undo cap from levelwind and remove pawl. Remove right hand side plate - taking care of the clicker mechanism (if your reel has one fitted) and its two plastic spacers. Flip up levelwind retaining plate and remove levelwind worm gear and shroud. Fit new worm into new shroud and push the new bearing into the other end of the shroud (the end with the cut-out). Lightly oiling the levelwind bearings before fitting the entire assembly. Ensure that the top of the line guide is correctly situated in the guide groove. Lock levelwind in place with retaining plate. Refit pawl and cap, oil levelwind worm. Refit side plate. Clicker side plates can be fiddly to refit and will need a bit of jiggling to get them correctly located - the precise technique depending on the style of clicker fitted. The levelwind is certainly easier to move with two bearings in it - you can push it across by hand even when the reel is in gear. I am pretty well convinced that this does make for a smoother feeling reel. Whether it adds to casting distance I cannot say, but it certainly doesn't cut it down! You can simply replace the fibre drag washers with Smoothies or Xtreme Smoothies, or you can replace both the fibre and the metal ones. Smoothie ground and lapped metal washers are noticeably smoother than the factory washers. The following instructions are for fitting both fibre and metal replacements. Remove handle, star wheel, and left hand side plate. Remove main drive shaft assembly and take off all drag washers (20960, 20907 x 3, 2095, 2096), and the main drive gear to access the washer (13169) below it. Clean drive shaft and gear with lighter fuel or a degreasing agent. Fit the Smoothie washers in the correct order. The domed factory fitted washer (20960) is replaced by a thick flat washer and a rounded washer - ensure the rounded washer is above the flat washer. Do not oil or grease any of the new drag washers. Refit main drive shaft assembly and side plate - ensure that the sleeve (22001) is refitted with the semi-closed end uppermost. Refit star wheel and handle. A non-jerky drag that can be tightened up without locking entirely. If the Smoothie drag ceases to be smooth, strip it down, degrease, dry and refit. When your spool bearings get worn out there is the option of replacing them with Abu factory bearings or upgrading them with ABEC rated bearings or the new ceramic 'Rocket Bearings'. The method of replacement is identical for all types. Bearings come in standard sizes, so look up your local bearing dealer in the Yellow Pages and take along the ones from your reel - they'll have some to match. You can also fit bearings to reels that don't have them, but are fitted with bronze bushings. Take the new bearings, clean them in lighter fuel, dry them off and spin them to make sure they are free running before starting work. Oil the new bearings with a couple of drops of Yellow Label Rocket Fuel. Remove left hand side plate and remove spool. Take the nylon cog off one end of the spool and remove bearing, replacing it with one new bearing. Make sure to place the old bearings somewhere well away from the new ones so you don't get them mixed up! Refit the nylon cog ensuring it is firmly in place. Carefully take retaining clip out from other end of spool, remove brake block holder. Drop out old bearing, making sure the washer underneath it isn't lost, and fit second new bearing. Refit brake holder and retaining clip. Pop spool back on spindle and refit right hand side plate. While changing handles is one answer to lure speed control, you can also avoid the extra expense of buying a completely new reel to get faster or slower gearing - simply by fitting new gears! You will need both the main drive gear and the pinion gear for the ratio you want. Consult schematics for part numbers, or check out sources on the links page. Instructions for performing a complete strip-down of a 6501C3 can be found from the maintenance page. Schematic - highlighting parts involved in the modification. Remove right hand side plate and bearing cap. Remove bushing retaining clip (5229) and push out bronze bushing (13244). Fit one bearing (5230), replace clip and cap. Refit side plate. Remove handle, star wheel and left hand side plate. Remove bearing cover cap from side plate, push out bronze bushing (13244) and replace with bearing (5230), replace cap. Remove plastic bushing (21601) from main drive shaft. Fit dished spring washer (6956). NB: the schematic diagram shows two washers in place (25475, 6953), but my reel had only one dished spring washer, placed concave side up, which I turned around before fitting the spring washer (6956) - the drag appears to function normally. Fit first bearing washer (21592), bearing (21591) and second bearing washer. Replace side plate, star wheel and handle. 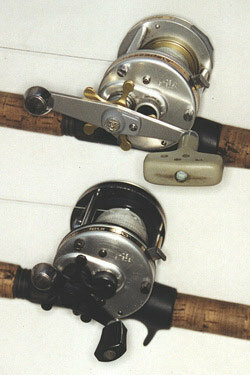 A quieter and more free running reel that should last longer before major surgery is required.